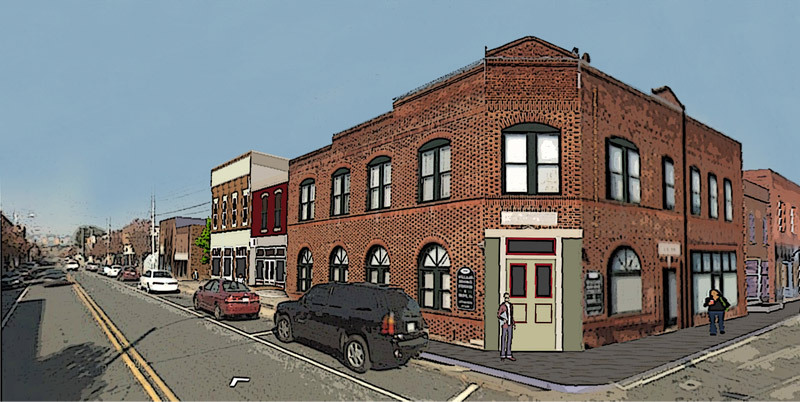 Coaly Design contracted with the Town of Siler City to develop a master plan for their downtown. Coaly Design held a series of community meetings with Siler City residents and business owners, and facilitated a survey (in both English and Spanish languages) to assess the community's needs and desires. The master plan focuses on aesthetic improvements to the downtown such as streetscape design, building façade improvements, and suggesting improvements to the Town's Code of Ordinances. Coaly Design along with the steering committee developed a list of priority design projects as part of the master plan process. Coaly Design presented design concepts for each priority. The master plan and priority concepts were approved by the Town Board in March of 2013. In the spring of 2013, Coaly Design contracted with the Town of Cooleemee, NC, and ORA Architecture, to develop a Master Plan for the town and the renovation of the site and buildings for the town’s historic cotton mill. The Master Plan included pedestrian connections to existing parks, town community buildings, new town entrance signage, and recommended infill development. 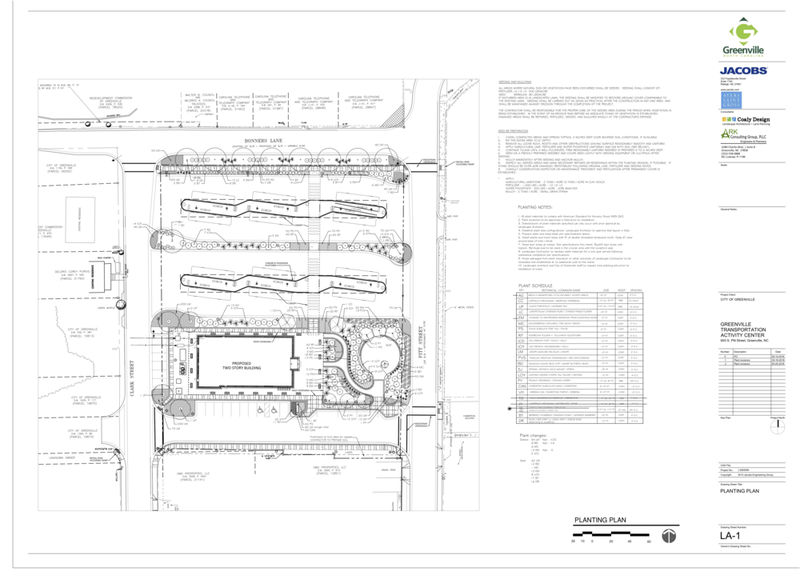 A detailed site plan was completed for the Cooleemee town square and mill. The former town square, built at the turn of the century, was removed after the mill closed. The renovated mill site and town square provide a community gathering place for informal picnics on the green, farmer's markets, outdoor movies, and outdoor seating areas for retail and restaurants in the mill. The Town is currently acquiring funding for the first phase of the renovation. Coaly Design was the lead consultant facilitating the production of the Recreation and Open Space Plan for the Village of Whispering Pines, located in Moore County, NC. The team worked closely with the Village’s Recreation and Open Space Committee and Village planning staff. The process began with a site analysis of the Village’s natural landscape, existing land use patterns, and an inventory of open space and recreation facilities in the Village. The consultant team led an initial community meeting to gauge the resident’s preferences and feedback. The final plan was approved by the Village Board in 2012. Coaly Design partnered with Alta Greenways and Planning to develop a Comprehensive Pedestrian Plan for the Town of Siler City. The project was funded through NC DOT and the Town, with a citizen project steering committee guiding the development of the plan. Our consultant team held a series of community meetings, facilitated a survey (in English and Spanish languages), and engaged the public at several public outreach events. The survey assessed the Town's needs, priorities, and opportunities for improving the pedestrian environment. Feedback from residents through the survey and public outreach events was key to the development of a successful pedestrian plan. The draft plan was presented at the National Night Out event held in August of 2013, where town residents had the opportunity to review and comment on the plan. Priority projects were chosen and intersection or road improvements were addressed through Code revisions, programs, or graphic representations. The final plan was adopted by the Town in October of 2013. Coaly Design contracted with Parkside Developers and the Town of Apex to design a greenway for the Arcadia Ridge housing development and the Town of Apex, in Apex, North Carolina. The greenway is a neighborhood connector which joins the Town’s regional greenway system. The Arcadia Ridge Greenway connects the Town’s Nature Park along the Beaver Creek greenway to the American Tobacco Trail. The greenway traverses wetlands and includes a small open space at the high point of the neighborhood which provides views of the flood plain and creek area. 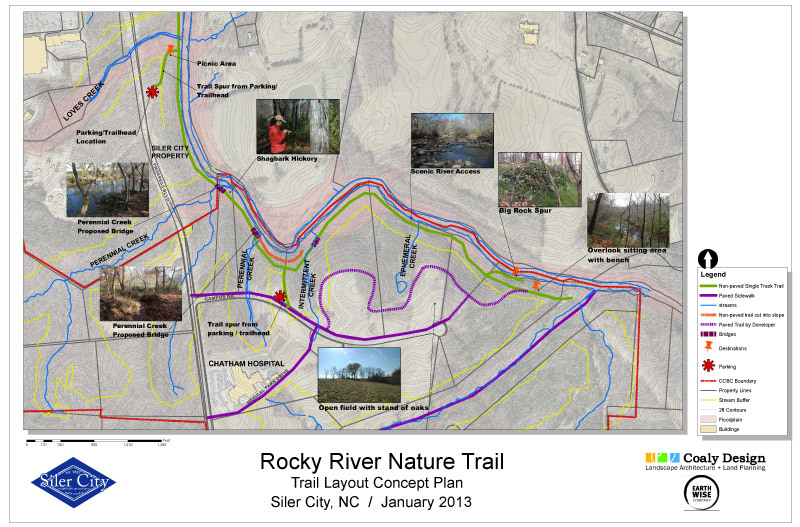 Coaly Design completed a site analysis, feasibility study, and conceptual layout plan for the Rocky River Nature Trail, located in Siler City, NC. The proposed trail is approximately 1 mile long and parallels the Rocky River. Coaly Design hiked the area during 3 field investigations and used GPS to locate unique flora, fauna, topographical features, and amphibious wildlife. We also used GPS to field locate a potential trail, trail spurs and connectors, and trailheads. The data was collected and assembled using GIS software. The deliverables were a field analysis, feasibility report, and conceptual trail layout. Coaly Design contracted with Lennar to design a greenway for the Smith Farms housing development and the Town of Apex, in Apex, North Carolina. The greenway provides multiple neighborhood connectors which join the Town’s regional greenway system along the Reedy Creek Greenway. The Smith Farm greenway provides a direct connection to the American Tobacco Trail. The greenway traverses a steep creek corridor with a boardwalk and bridge section. The Smith Farms Greenway is currently under construction. Coaly Design has contracted with Wilkes Habitat for Humanity to design an affordable housing community in Wilkesboro, North Carolina. The community is the first of a kind for Wilkes County and will include Habitat for Humanity homes and housing guidelines, while also offering a few market-rate homes. The site is 6 acres and includes 23 single family lots. The site incorporates traditional neighborhood design principals such as narrow lots, large front porches, sidewalks, and a narrow road section. The property is located on a ridge overlooking downtown Wilkesboro with an internal greenway connecting to a proposed Town greenway, Cub Creek Park - the Town’s destination park, and to downtown. 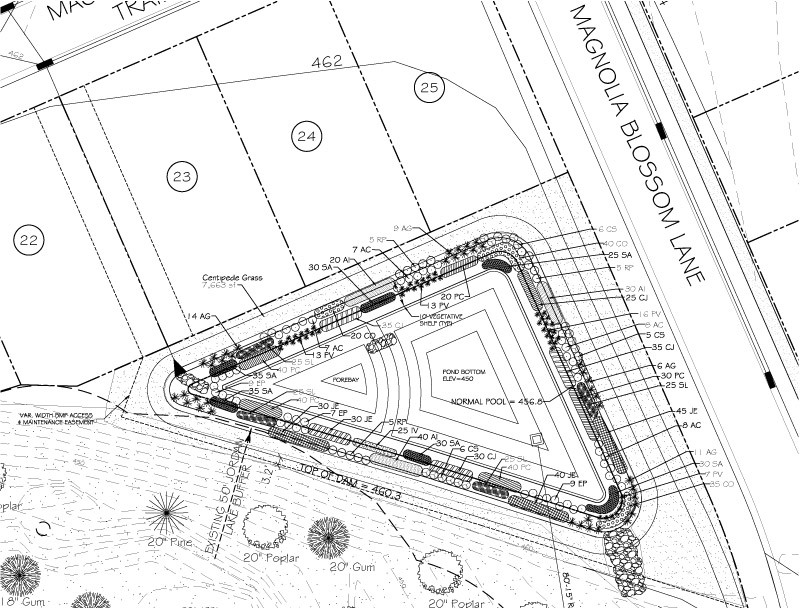 The Town Board approved the master plan in late 2015, and Coaly Design is currently producing the construction drawings. Coaly Design contracted with the Town of Spring Lake and the Kingdom Community Development Corporation to vision, plan, design, and produce construction documents for a conservation based affordable housing development. This project follows the Enterprise Green Communities Criteria 2008. The site is 4.88 acres and has 28 lots (single family and town homes) centered on a community green space with a central greenway connecting to a 100 acre future park for the Town of Spring Lake. The site layout conserves 40% of the site for open space and incorporates innovative stormwater management controls. A two-day charrette for the project was held in the fall of 2009, with Coaly Design leading the site design portion of the charrettes. The attendees at the charrette were local politicians, Town staff, residents of the existing Balsawood Village mobile home park, neighbors, and local business owners. The first day was spent on visioning for the project to determine the character of the development and the second day was a hands-on design workshop to layout the physical aspects of the site. The project was approved by the Town Board in 2012. The Transfer Co. (Stones Warehouse site) is a 2-acre historic property located on one city block in downtown Raleigh. The project includes a renovation of an historic building over 200 years old, 14 new townhomes, and a public plaza. The Transfer Co. is a creative production hub for locally grown food and business entrepreneurs to promote local food awareness and availability. The food production spaces will be arranged around a multi-use community hall and outdoor community gathering space available to both tenants and the neighborhood. The food production bays will be open to encourage visitors to learn about the foods and how they are produced, and to allow the local food producers to directly engage the broader community. Coaly Design has contracted with The Transfer Co. to design a unique streetscape and public plaza environment that seamlessly connects the neighborhood with the community space. The design of the community space is flexible, sustainable, and inclusive to the city and neighborhood for which it will serve. The landscape focuses on pollinator and edible plant material. Coaly Design contracted with the Bell View Partners, LLC, to design the streetscape environment for a 7-story aLoft Hotel, located on Hillsborough Street, in Raleigh. 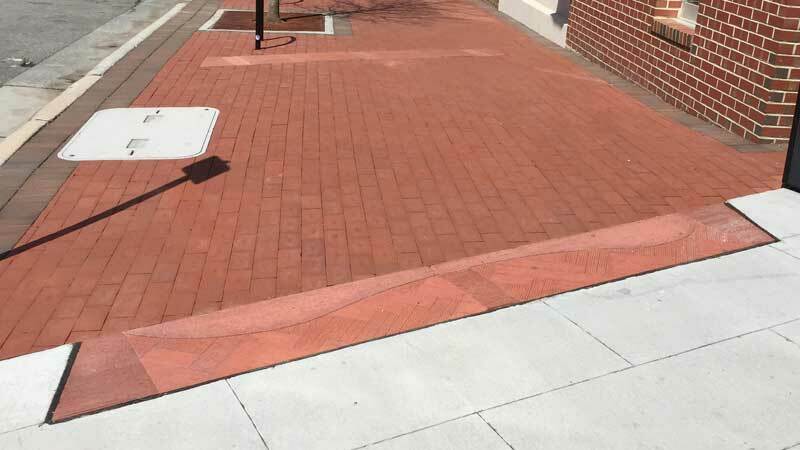 The site is located adjacent to North Carolina State University’s iconic bell tower and streetscape in this area serves as an important pedestrian connection for the public and students. 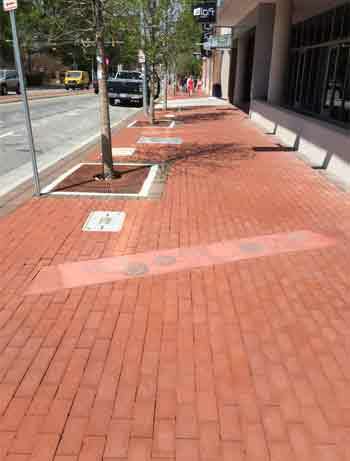 The streetscape design follows the pattern established along Hillsborough Street, while also responding directly to the unique location of the site adjacent to the University. The streetscape design includes 10 custom concrete bands in the sidewalk angled towards the bell tower. The art work in the bands was designed by Coaly Design to represent the 10 Colleges at NC State in the concrete. Materials were used to create impressions in the concrete to form the art work. The hotel opened in the fall of 2015. Coaly Design has partnered with ARK Consulting Group and the City of Greenville to design the Greenville Transportation Activity Center. The site is located in the Uptown District and is a bus transfer station for city busses and also houses a police substation. The site is also the beginning of the 8th Street connector, which will connect this site to East Carolina University. The site includes a courtyard design, incorporating outdoor seating areas for transit users, a sculpture area, and coherent pedestrian connections to and from the site. Coaly Design contracted with the owners of Trophy Brewing to design the site improvements for the brewery and tasting room on Maywood Avenue in Raleigh. The building and site were converted to house the brew facility and provide indoor and outdoor seating with event spaces. Coaly Design is currently working on site improvements for Trophy Brewing and Pizza located on West Morgan Street in downtown Raleigh. The award winning brewery and pizza restaurant site improvements will provide an expanded restaurant and tasting room, additional outdoor seating, and accommodation for large private parties. In the fall of 2014, Coaly Design contracted with the Town of Carrboro, and partnered with obs landscape architects, to redesign the Carrboro Town Commons. The Town Commons are the venue for numerous town events throughout the year, such as Carrboro Day in May, the July 4th Celebration, the Halloween Parade, and the Carrboro Film and Music Festivals. The most intense use for the site is the extremely popular bi-weekly Farmer’s Market. The redesign of the commons allows for additional venders, parking, and usable open space for non-farmer’s market hours and the other events. The plan also promotes adequate bicycle and pedestrian facilities. The concept plan was adopted by the Town Board in December of 2014. Coaly Design partnered with McGill Associates to produce the construction documents. Coaly Design partners with developers and civil engineers to complete planting plans for resource conservation areas and constructed wetlands. 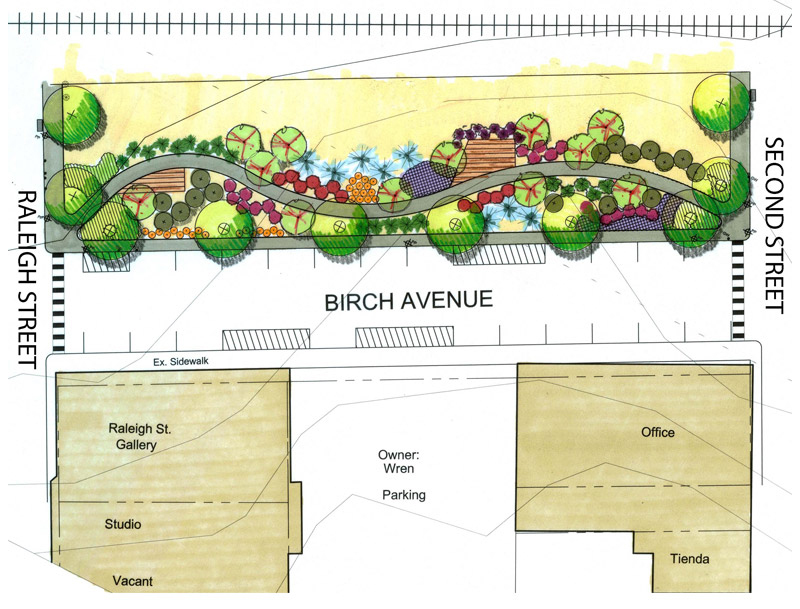 These plans include streetscape buffer plantings to enhance and conserve the existing vegetation with native plants. The wetland pond planting plans establish hardy wetland plants in constructed ponds in community developments to permanently control storm water. Typical plants include Arrow Arum, Pickerelweed, Softrush, and Sawgrass, and are planted to NC's Division of Water Quality's standards.